One of the most popular additions to the home security system is wireless cameras. Wireless cameras allow you to see areas of your home or property that may be a prime target for trespassers and would-be intruders. You can also record any activity that you need to be aware of, or relay to the local authorities. They are a great investment for homeowners and help give you peace of mind. These top wireless home security cameras are durable, easy to install, and gives the homeowner plenty of options. You should install a home security system is to secure your family and property. Every 13 seconds a home burglary takes places, 4 burglaries a minute, 240 an hour and nearly 6,000 a day! Samsung is known for making some of the best electronic products available, and this battery operated HD Wifi camera is no exception. It comes with night vision and a 110-degree field of view. In addition, you can also live-stream video from this security camera from just about any remote location. It records in a 720p video with good resolution for a clear picture. This is a solid option for people serious about home protection. This forward-thinking wireless security camera has all the feature you want for your modern home. It comes with a weatherproof housing, two-way audio, alerts, sirens, and PIR motion sensors. This camera can be placed anywhere inside or outside of the home and is even solar powered to help reduce energy costs. This model also comes with rechargeable batteries for less waste. This wire-free camera option is great for most uses around the home and is a great way to protect your home and stay in touch with everything happening around your space. This camera bundle is designed for indoor use and comes with two, night-vision, wifi enabled cameras. This package comes with the sync module as well and offers helpful features such as temperature sensors, HD video, Live view, low-light illumination, and instant alerts. Stay on top of everything that goes on in the home and offers your family a greater degree of protection with this economical package. Protect America has a variety of home security options and equipment, especially if you are interested in wireless home security cameras. They offer 24/7 monitoring of your home with a contract service agreement. They have rates as low as $30 per month and even offer their new clients up to $1400 in free equipment. Another great reason to consider them for your home security needs is that they offer a locked-in price match guarantee so you know you are getting the best deal around. You also don’t have to ever worry about paying installation fees. They give you all of the features you want without all of the hassles. 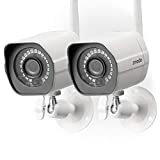 If you are interested in finding the best wireless home security cameras and home security systems available, check out the Protect America website. There you can find out more information on their services and products. You can even submit a form for your personal free quote.